A 40-year-old Hispanic male presented with a 2-day history of sharp right lower quadrant pain and subjective fevers. On physical exam, he was afebrile with normal vital signs. He was moderately tender in the right lower quadrant without guarding or rebound. Labs were notable for a leukocytosis of 17.7. The patient had a 6-month history of similar episodes of intermittent pain, with one requiring admission. 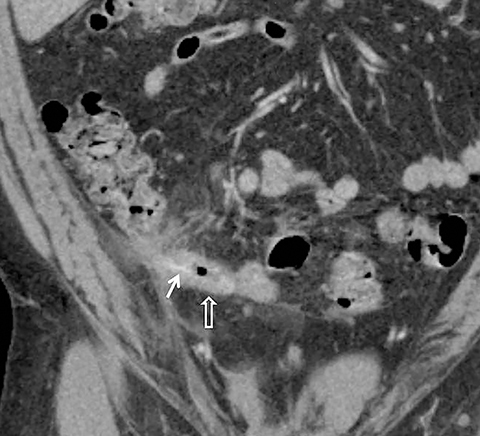 A contrast-enhanced CT scan at that time showed inflammation in the right lower quadrant centered about a loop of thick-walled distal ileum (Figure 1A). The appendix was notably normal (not shown). Findings were thought most consistent with an infectious enteritis, with the differential including inflammatory bowel disease and Meckel’s diverticulitis. He improved with intravenous antibiotics, but re-presented to the emergency department 1 month later with similar symptoms, with CT showing persistent but improved inflammatory changes in the right lower quadrant (Figure 1B). Now presenting a third time with recurrent symptoms, he again underwent imaging with intravenous contrast-enhanced CT. This demonstrated significant worsening of inflammation in the right lower quadrant, now with a 3.0 x 2.3 cm rim-enhancing fluid collection consistent with an abscess (Figures 1C and 2). There was no free air. Within the inflamed loop of distal ileum that had been seen on the two prior exams, there was a thin hyperdense linear structure impacted in the wall, with one end piercing the wall and sitting free within the peritoneal cavity (Figure 1C). Retrospectively, this linear structure was present on the two prior exams but obscured by adjacent enhancing bowel wall and inflammation (Figures 1A and 1B). This now had penetrated further through the wall and into the peritoneal cavity, thereby making itself for more apparent. Findings were most consistent with chronic foreign body perforation, now complicated by a small abscess. The patient was taken for diagnostic laparoscopy with intraoperative findings concordant with those seen on CT. The inflamed segment of small bowel was approximately 15 cm away from the terminal ileum and was resected. Within this segment of bowel was a wooden toothpick (Figure 3). The patient had an uneventful postoperative course. 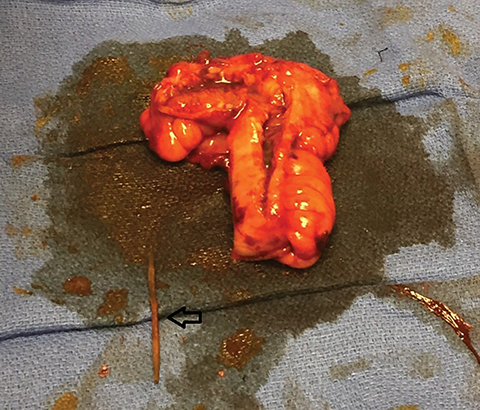 We presented a case of a distal small bowel perforation cause by accidental ingestion of a toothpick. As discussed in the literature, accurate diagnosis was challenging due to the patient’s inability to recall the ingestion and the inconspicuity of the thin linear hyperdense toothpick against the surrounding inflammatory change and contrast-enhancing bowel wall. Delayed diagnosis ultimately lead to abscess formation, a common complication. 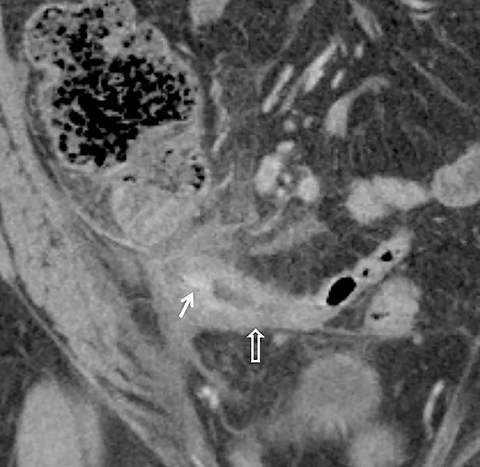 We emphasize the importance of maintaining a high index of suspicion for foreign body perforation in the presence of nonspecific signs of bowel inflammation and localized peritonitis. Goh BK, Tan YM, Lin SE, Chow PK, Cheah FK, Ooi LL, Wong WK. 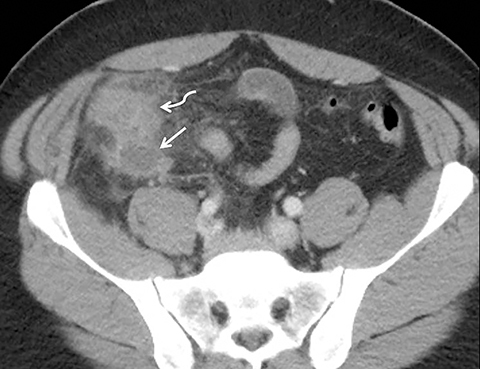 CT in the preoperative diagnosis of fish bone perforation of the gastrointestinal tract. AJR Am J Roentgenol. 2006;187:710–714. Nassani N, El-Charabaty E, Nasr P,et al.. Foreign body penetration through jejunal loops causing renal artery thrombosis and renal infarct. ACG Case Reports Journal. 2017;4. doi:10.14309/crj.2017.12. Kuo CC, Jen TK, Wen CH, et al. 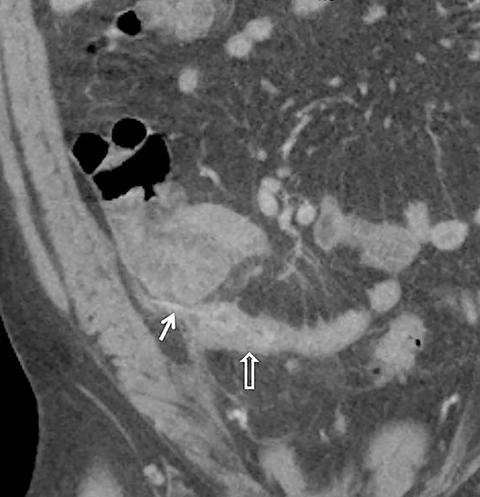 Medical treatment for a fish bone-induced ileal micro-perforation: A case report. World J Gastroenterol. 2012; 18: 5994–5998. Izumi J, Satoh K, Iwasaki W, et al. Small bowel obstruction caused by the ingestion of a wooden toothpick: The CT findings and a literature review. Intern Med. 2017; 56: 657–660. Gosis J, Wright M, Kuzminski C. Chronic intestinal perforation by a wooden toothpick, complicated by abscess formation. Appl Radiol. 2018;47(9):32-34. Prepared by Dr. Gosis and Dr. Wright while radiology residents, PGY4 and 3 respectively, at Santa Barbara Cottage Hospital in Santa Barbara, CA; and Dr. Kuzminski while a staff radiologist at Santa Barbara Cottage Hospital in Santa Barbara, CA.